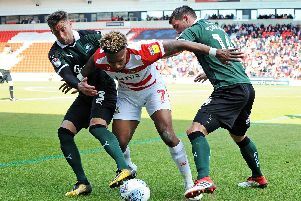 Keshi Anderson suffered a suspected broken leg against Rochdale. Darren Ferguson admitted his players were affected by a horrible injury to Keshi Anderson. But the Scot refused to use that as an excuse for his side’s 2-0 defeat to Rochdale. “We were a bit flat at times. We didn’t have that cutting edge that we have had,” said Ferguson. “We were quite dominant in the first half and their threat came from the counter attack. We spoke about pressing better so they can’t get that ball forward. “It looked like it was going to be 0-0. You need someone to come up with a bit of magic and unfortunately it was them and not us. “The second goal was just a poor mistake from H [Harry Middleton]. He’s young, he’ll have to get over that. “I do think the injury to Keshi had an impact on the players. “I’m not making any excuses because I don’t. But I think visibly my players were quite upset with it because they could see the boy had a really bad injury. “We’d got him on for a bit of a spark and he looked like he was causing them problems. It’s a real shame for the boy, it looks like he’s broken his leg. “I don’t think there was anyone near him, but that can happen. He’s gone to hospital.